PLEASE CLICK HERE FOR IMPORTANT DEHUMIDIFIER DELIVERY INFORMATION! 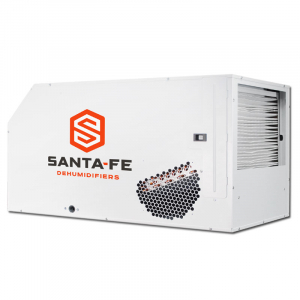 * High Efficiency - The high efficiency Santa Fe Impact155 produces over 7.9 pints per kilowatt/hour, far better than most mass merchant dehumidifiers. * Large Capacity - The high capacity Santa Fe Impact155 provides up to 150 pints per day water removal at standard rating conditions. Large-sized crawlspaces (up to 3600 sq. ft.) are no problem for the Santa Fe Impact155. * Low Temperature Operation - The Impact155 was engineered for crawlspaces and basements - and the temperature and air flow issues that they present. When many mass-merchant dehumidifiers have stopped removing water, the Santa Fe Impact155 continues to protect your family and your home. * Superior Air Filtration - MERV-13 filtration is standard on the Santa Fe Impact155, capturing particles (including mold spores) down to 1 micron in size. This superior level of air filtration also keeps the Santa Fe Impact155 working at peak efficiency for longer than other devices with cheaper designs. * Optional Equipment - Ducting kits and condensate pumps are available for use with the Santa Fe Impact155. These optional kits provide the ultimate in flexibility for your specific installation requirements. Because basement and crawlspace floors and walls are in contact with the soil, and soil temperatures several feet below the surface remain at a constant temperature of 50°F- 60°F. Basement and crawlspace floors and walls tend to remain cool. Since basements and crawlspaces tend to be cool, and cool air holds less moisture than warm air, they will have higher relative humidity. Typically, the closer to ground level, the larger the area, and the damper the environment, the more capacity that will be necessary to dry out the area. Capacity is usually measured in the number of pints of water that a dehumidifier can remove from the air at a given temperature over a given period of time. Capacities for residential dehumidifiers are measured in pints of water removed per day at standard conditions. Standard conditions are determined by the American Home Appliance Manufacturers (AHAM) and are used because capacity will vary under different conditions. AHAM standard rating conditions are 80°F and 60% RH. The capacity for the Impact155 is 150 pints per day. Most standard residential units range from 20 to 65 pints of water removal per day. However, most basements and crawlspaces are cooler than 80°F and therefore the water removal capacity of the standard residential unit will be diminished significantly. A large capacity dehumidifier is necessary to ensure that enough moisture is removed at the real-world temperature of your basement or crawlspace to prevent mold, mildew and bacterial growth. The Santa Fe Impact155 is a large-capacity dehumidifier designed for these cooler applications. National Trade Supply, LLC is one of the largest Santa Fe Dealers in the United States. We stock the entire Santa Fe family of products and accessories in our own facility providing you with a quicker turnaround time and instant tracking information on your order. We have installed hundreds of units in all types of applications and can offer expert advice on how to properly install yours. We are also an authorized service center for Santa Fe products and can offer warranty service and replacement parts. If you are looking for the best possible dehumidifier and a company who can stand behind it, Santa Fe and National Trade Supply is the clear choice.